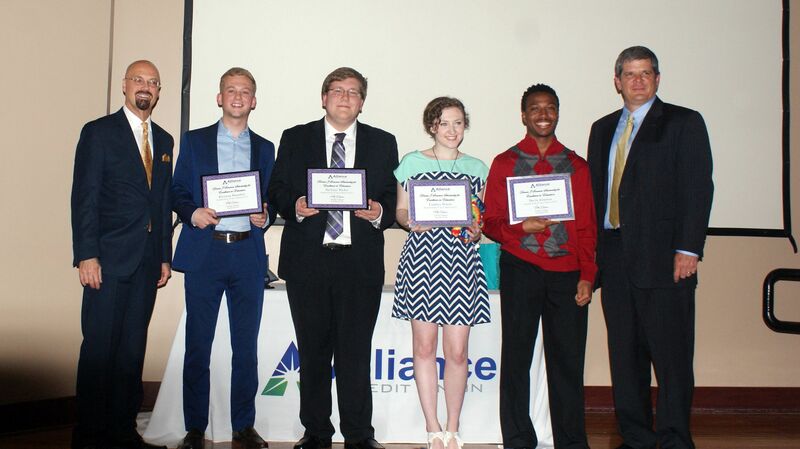 2017 Dennis J. Sommer Scholarship for Excellence in Education Winners (from left to right): Vice President of Human Resources Frank Evans, Kiernan Donahue, Zachary Hisler, Lindsey Peters, Devin Jamison, and CEO Tim Stephens. Scholarship winner Shelby Damron is not pictured. Alliance Credit Union awarded $1,000 to five Dennis J. Sommer Scholarship for Excellence in Education recipients at its 69th Annual Meeting on March 29, 2017. Scholarships recipients were selected on their ability to highlight how they would change their community in a positive way in an essay. Academic achievements, community involvement, and financial need were also considered in the selection process. Since its 1997 inception, Alliance’s scholarship program has awarded more than $75,000 in college scholarships to date. To be eligible, applicants must be Alliance Credit Union members (or the son, daughter or grandchild of an Alliance member), as well as either a full-time college student or a high school student that will be a full-time college student in the following year. To apply next year, simply download our 2018 online scholarship application that will be available on our website in December 2017. You may also pick one up at any branch.